As you can probably imagine, I was ridiculously excited to hear that Gretchen Rubin had a new book coming out this year. Back in the fall, I got an advance copy of it and read about 1/4 of it before Ani stepped on my Kindle and broke the screen. That was a sad morning. Once I’d obtained a new Kindle (via ordering it in the US and having it shipped to my mom who brought it over when she came to visit), I finished it up in record time, then reread practically the whole thing aloud to both Bart and my mom. And then in January I reread it again. I’m a mega-fan of both The Happiness Project (which I wrote about here) and Happier at Home, but I’m inclined to think this is her best book yet. This one is all about habits (if you. . .hadn’t guessed that from the subtitle) and it was so ridiculously motivating and inspiring to me. My working in the morning – which has come to a dead stop with a new baby – was in part inspired by this book. I thought the book might focus on specific habits, but instead it’s really a guide to how to implement (or break) the habits that are important to you, whether those are diet and exercise, family and relationship-related, work or travel or budgeting. She starts out with four categories of people – Upholder (follows through on both internal and external obligations), Questioner (questions rules and accepts them only if they make sense), Obliger (great at following through for other people but struggles to keep commitments to themselves) Rebles (resists rules both from others and themselves). As the book goes on, she describes different methods and how they work for different personality types. And she is pretty exhaustive in all the different methods for maintaining good habits and breaking the ones you don’t want to have anymore. I felt like I learned so many good strategies and rereading helped me remember them better. I feel like I’m making this sound kind of dull and textbook-y, but it was FASCINATING. She had tons of interesting stories and examples, and it was one of the most compelling books I’d read in ages. I highly highly recommend it. I listed this as one of my favorite books I read last year and I wouldn’t be surprised if it ended up being on my 2015 list too. Is that allowed? I'm so excited to read this book! I love Gretchen Rubin, and this sounds like it's exactly what I need right now. I've been frustrated with myself lately because I feel like I don't keep commitments to myself very well but if I tell someone else about that commitment (even if it has nothing to do with them), then I always follow through. So maybe I'm an Obliger? I'm excited to find out. I'm adding this to my list ASAP! I'm having such trouble making sense of my day now that I've had my first child… It's been SUCH an adjustment for me, I feel like this book would really help! i LOOOOVE Gretchen Rubin, I pre-ordered this month's ago and can't wait to get it like, next week! And I need help making better habits, so I feel like all my dreams are about to come true. This is a great book. It's entertaining, you will learn something, and it has the potential to be life-changing. Hard to ask for anything more from a book – highly recommended. I just finished listening to the audio version of the book this weekend. It was very good, I'd like to add a copy of it to my home library and reread it to mark up the pages that are full of great advice. 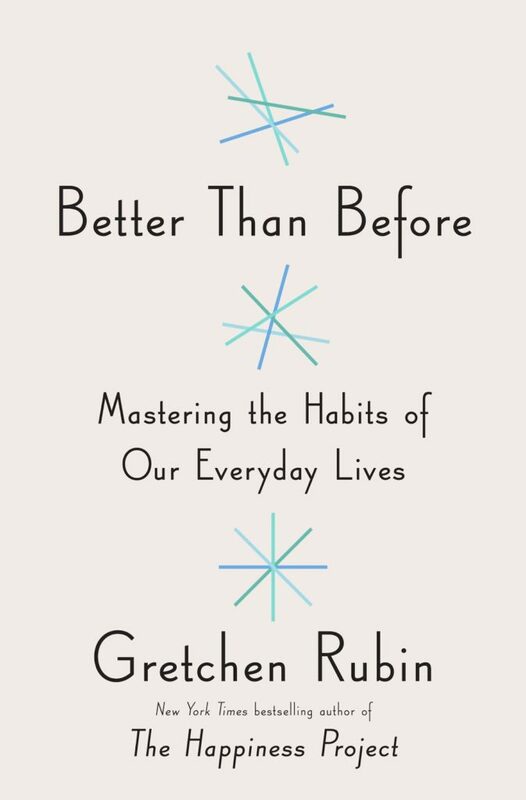 I'm so encouraged by Gretchen Rubin; it'd be hard to read this book and not work on developing good habits (and getting rid of bad habits too).